Park Yong-sung rules out possibility of co-hosting Olympics with N.K. He was relaxing for the first time in several months. Sitting in his office in Seoul on Monday morning, Park Yong-sung, the president of Korean Olympic Committee, said he was taking a short break from the sports world. Until last week, Park had kept a grueling schedule, travelling around the world, participating in numerous international events, while promoting PyeongChang’s 2018 Olympics. Park, who served six years at the IOC until 2007, has been involved in PyeongChang’s bid over the past decade. His long battle for the Winter Olympics is now over as the Gangwon Province city, after two failures, finally won the right to host the 2018 Games, winning the majority of votes at the IOC session in Durban on July 6. The KOC chief, however, noted that the real battle is yet to come. “We have only six and a half years to prepare for the 2018 Games, and it’s a really tight schedule,” Park said. Park said he was worried that there were already some people trying to tarnish and diminish PyeongChang’s Olympic campaign. He was referring to the recent protest by some environmental groups. They are opposed to PyeongChang’s proposed alpine skiing venue in Jungbong, as the vast forested area is currently protected as a nature reserve. “We’ve had numerous open discussions, tested all the possibilities before submitting our bid book to the IOC. I don’t understand why people are bringing up this subject again,” Park said, insisting that he would stick with the original game plan. Park also ruled out the possibility of co-hosting the 2018 Games with North Korea, noting that PyeongChang would keep its promise to the International Olympic Committee. “We’ve made promises to the IOC in our three-volume bid book, and we’ll work hard to keep the promises. That is most important for me,” he added. PyeongChang needs to build six additional competition venues before 2018, including a new alpine skiing venue, ice hockey arena and also a sliding venue for bobsleigh, skeleton and luge. Building new venues on schedule is important, but the most immediate task for PyeongChang is to nurture more winter sports athletes, said the KOC head. He admitted that the popularity of winter sports here, in particular some skiing events such as biathlon, ski jump and cross country, is still considerably low. To attract more fans, he said, finding more star athletes is crucial. “You don’t go to a swimming pool just to see games. You go there to see stars such as Park Tae-hwan. We need to nurture more stars in winter sports,” he said. The plan has already kicked off with the government and the KOC working together to develop a youth program, titled “Drive the Dream,” with more than 550 billion won ($518 million) of investment. “We also need to train volunteers and game officials for the Games,” he added, noting that the KOC is planning to host more international winter sports events in preparation for the 2018 Olympics. There are more than 200 Olympic committees around the world, but currently only 70-80 of them are participating in Winter Games, according to Park. “We hope and believe more than 100 countries will be coming to PyeongChang in 2018. It will be the biggest Winter Olympics ever,” he said. The head of the Korean sports governing body, who is also the chairman of Doosan Heavy Industries & Construction Co., sees the 2018 Winter Games as a chance to upgrade not only Gangwon Province but the entire country. “Like we saw in 1988 after the Seoul Olympics, PyeongChang will bring a huge change to our country,” he said. 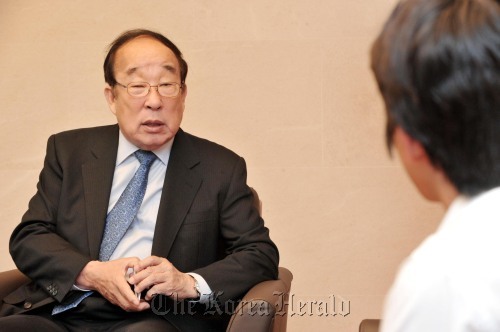 He noted the first task for PyeongChang is to establish the local Olympic organizing committee as soon as possible. There are already some debate on who should lead the committee, and Park, who is arguably the most influential sports official here, is one of the strong candidates. He was a member of the IOC from 2002-2007, and also headed the International Judo Federation in 1995, and recently, he was elected as a vice chairman of the Olympic Council of Asia. Park is now 71 and knows his time with the KOC is entering the final stage, but it seems he will go out on a high. “I think I’m very lucky to be involved in the Winter Games,” he said. “Now, I just hope my health allows me to see the opening ceremony of the Winter Games here,” he smiled.